We are back! Sorry that we dropped off the face of the earth and have had very few blog posts the last couple of months. That is what happens when you take a 3 week European vacation. The weeks leading up to the trip were so busy with all the preparation to put projects on hold for 3 weeks that the blog definitely took a back seat. We had every intention of getting back at it the first of October and that just didn’t happen. Getting back from a 3 week vacation is pretty much just as crazy as it was getting ready to leave. However things are finally getting back to normal. Thankfully we are still very busy, but things are getting back to normal. This had me thinking, it is time to say hello to all of you again and get back to making our normal posts. The Europe trip was amazing. We call it European Extravaganza 2015. We flew from Arizona to Dublin, then to Paris for a week. From there we took the train through Germany to Rothenburg ob der Tauber, then to Hohenschwangau in the Alps to see some amazing castles, to Munich for Oktoberfest, and then on to Salzburg and Vienna in Austria before flying back home. We plan to share some of our experiences from each of the cities here on the blog. We may even throw together a few travel tips for traveling through Europe for you all to read. Today we will start by sharing the highlight of the trip with all of you. 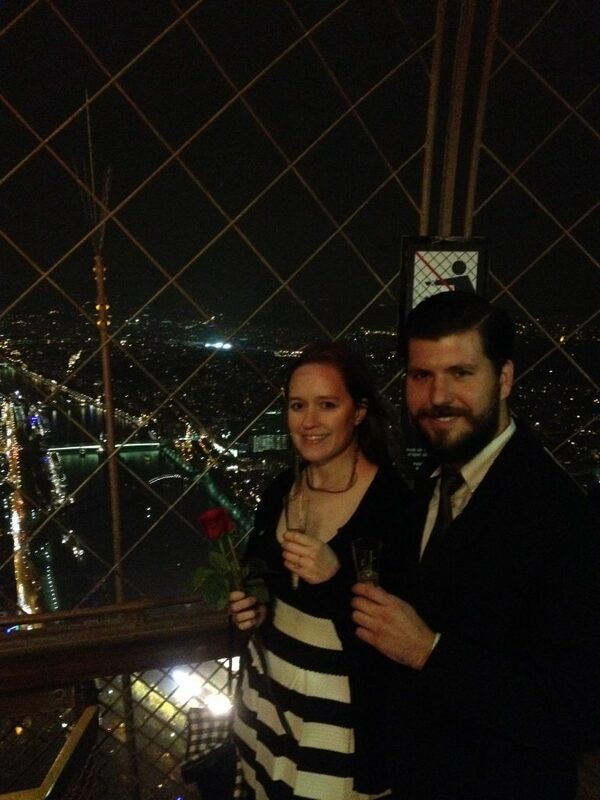 Enjoying a glass of celebratory champagne at the top of the Eiffel Tower. While in Paris, WE GOT ENGAGED! We had the perfect Parisian day exploring and getting lost in the city, wandering through beautiful gardens, and eating amazing food. We had planned a Paris date night and got all dressed up to go to dinner. After dinner we had a river cruise on the Seine booked at sunset to see everything lit up at night. You really can’t beat Paris lit up at night, it’s absolutely gorgeous. After our river cruise we had skip the line (who wants to wait 2 hours) passes to get up the Eiffel Tower. Noah was filming our walk from the boat to the Eiffel Tower and once we go beneath it he handed the camera off to another person in our group and before I knew it he was down on one knee with a ring in his hand! I was completely shocked and had no idea this was going to happen. Of course I said yes! After, we headed up the Eiffel Tower, made it to the tip top as the wind began to blow and the rain started. It was freezing, but we managed to have our celebratory champagne at the top of the Eiffel Tower, looking out over the city. We could not be more excited about this! Looks like we have a wedding to plan now!